If you have been keeping up with our renovation blog (http://mercuryreno.blogspot.com), you will know that our lives have been slightly chaotic for a long time. As the school year comes to end, we find ourselves in an accumulated pile of burdens and chaos that seems to have snowballed over the last few months. Perhaps the biggest thing is simply that this spring was not anything like Chris or I ever thought it would be. I planned to work toward finishing my thesis. Chris planned to take a long-term sub position and continue to hope for a full time job next year. We had no intentions of buying/renovating a house. We had no thoughts of Chris hurting himself in the midst of that process. We had no concept of what it would look like to have Chris try to work both his own job and the long-term sub job while recovering (twice) from knee things (the initial injury and then surgery eight weeks later). We had no idea that it would be so hard for me to finish a semester where I haven’t made any progress on my thesis whatsoever, can barely keep up with the one seminar I’m taking and the one lab section I’m responsible for. I fail to see worth in myself unless I am fulfilling my self-ordained plans. It is simple to feel the failure when I have not really accomplished what I set out to do with the last few months. 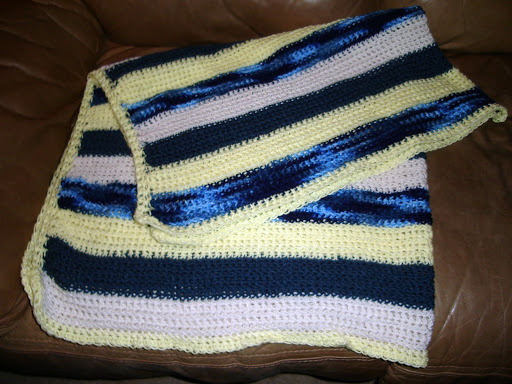 It has been a struggle even to see small projects (like the blanket below) get finished when their original purpose is no longer existent or has no use at the current time. I’ve struggled with idols in my heart and misconceptions about God and who He is and how He views me like I have never before in the twelve years I’ve walked with Christ. There have been so many times where I have looked at my life these past few months and wondered if there was any blessing in it. Don’t get me wrong – I know that there is blessing in it and blessing written all over every inch, even if I still don’t see all of it. But there are things that I have held so tightly to that they have accumulated upon my back and weighed me down. My relationship with God has been strained as I have struggled to understand what “blessing” and “common grace” and “love” all mean. I need rest for my soul. Pray that I find it in the only place it can be found.